knitwear design. natural dyes. witchy notions. 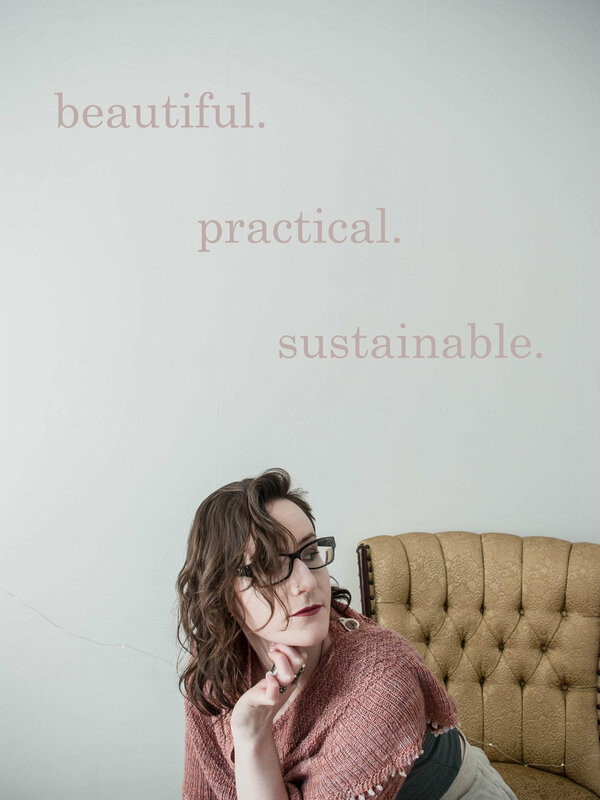 ash alberg is a queer femme and fibre witch who seeks to create beautiful and practical designs using sustainable methods. equally importantly, they seek to nurture the skills, knowledge, and creativity of fellow fibre witches to achieve their goals. follow ash's adventures in the canadian fibreshed over at from field to skin. as a genderqueer femme whose multi-disciplinary work incorporates performance and textiles, my focus frequently encompasses an effort to make the practical more beautiful and art more accessible. queer theory is always at the base of my work, with its foundations in deconstructing and destabilizing the status quo, and in tackling the many complex layers of oppression and privilege within society. a history in feminist and queer grassroots activism, as well as sexual health education, has resulted in consent politics being an integral part of every project i undertake. i believe firmly in the artist’s responsibility to create a safer and truly consensual environment for their audiences. it is through this openly presented option to engage or disengage with the artistic material that allows audiences to push themselves safely into potentially triggering topics to create wider social change. currently, my textile work covers knitwear design, natural dyeing and eco-printing, and an effort to document the juxtaposition of the slow process of my making with its instantaneous sharing on social media. i work with natural materials and leftovers, using shed bones, antlers, leaves, flowers, bark, and compost to create colours and textures with yarn and fabric. i chronicle my adventures in the canadian fibreshed over on from field to skin. my extensive theatre background expands across performance, playwriting, directing, and design. while not actively engaged in current theatre projects, i trained in collaborative devised theatre, with an emphasis in physical theatre and reimagining folk tales. my theatre history has allowed my current artistic practice to become more focused on the interactive aspects of art, and to assist in collaborations using my experience in tour management, design, and artist/audience interplay.